Within the last 2 decades Turkey, Greece and Croatia have become very popular charter destinations, but have you ever considered Italy? From the laid back island of Procida in Golf of Naples you have access to the famous islands of Capri and Ischia, the amazing excavations of Pompeii, the beautiful Amalfi and many small, interesting and unknown places. July and August are very busy, but June or September are great times to have an either early or late summer vacation. On a one week sailing vacation you can visit many attractions of one of the most spectacular bays in the world.Exploited by many ancient civilizations, it is an fascinating trip, linking the drowsy islands with the mainland and the excavations of ancient of Ercolano and Pompeii, buried in 79 AD by ashes of the erupting Vesuvius. 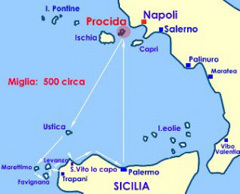 You can sail to the Egadi Islands, 130 nm south of Procida. Ustica is situated 35 nm from the Sicilian coast and is well worth a visit! A further 70 nm off is the Marettimo island and from there you can sail towards Favignana, the Levanzo Islands, Trapani, San Vito lo Capo and the fascinating city of Palermo. All around this area you will find the evidence of the traditional tuna fishing industry with the distinctive “tonnare” houses. If you have more time, we highly recommend the Eolian Islands to the East. A real sailing trip!!! Please contact us for more itineraries! Luxury yacht, only with skipper! SECURITY DEPOSIT : Euro 2.000,00. There is no daily insurance fee. INCLUDED: Automatic pilot, gps cruising guide, maps and insurance. Cd and stereo, tender, pillows, blankets, kitchen utensils etc. All yachts have fully battened main and rolling furling jibs. We will be happy to arrange airport transfers, car parking, provisioning and trips to Pompeii or Herculaneum.